Family Facts: I was raised in Illinois and have one younger brother. We were most likely to have guests from other countries staying with us rather than the US when we were growing up. Favorite Country: So many choices! I’ll probably say Israel, though. Me in 12 words or less: Calculated adventurer. Thoughtful and diplomatic – unless it’s time for a good joke. I work as an Operations Manager for an Ed-Tech company in South Texas which focuses on life coaching and developing the leaders of tomorrow. When not slaving away at the office, I love running (tough mudders! ), Krav Maga, hunting, and photography. International travel is an incredible way for us to expand our horizons and see our life in perspective of the needs in the world around us. 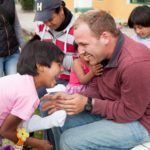 Because we know less about the culture and language, it is often easier to see God’s hand guiding us and working in our lives when we are several thousand miles away from “normal.” At the same time, we also have the opportunity to care for the needs of those around us and encourage our brothers and sisters in the Lord. It is a life-changing experience which will not soon be forgotten!